Honeywell IP Cameras work with the Lyric and Total Connect. Newer Honeywell Cameras can only be streamed from the Total Connect 2.0 platform. However, older legacy IP cameras can be streamed from both TC2 and the Lyric Panel itself. Streaming from TC2 requires alarm monitoring service. If a user wants to integrate security cameras with their Honeywell Alarm System, they will most likely need to choose from the options that are manufactured by Honeywell. These are usually marketed as Honeywell IP Cameras or Total Connect IP Cameras. Security cameras produced by other companies, such as Alarm.com or Arlo, usually cannot tie-in directly with Honeywell's alarm systems or their Total Connect 2.0 platform. Most of the Honeywell and Total Connect IP Cameras can be split into two categories. 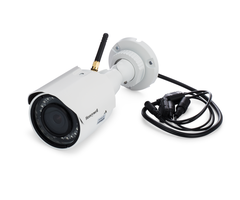 There are newer IP cameras with high-definition recording capabilities. These were once referred to as "Lyric Cameras", but Honeywell changed the name since they are used with TC2 and not with the Lyric itself. Today, these cameras are called Honeywell HD Cameras. This camera lineup includes the Honeywell IPCAM-WIC1, the Honeywell IPCAM-WIC2, and the Honeywell IPCAM-WOC1. These cameras can only be streamed from Total Connect 2.0, and they cannot be streamed from the Lyric Panel. All of these are still available for purchase from Alarm Grid as of early 2019. There are also older-style Honeywell IP Cameras, which are commonly referred to as "legacy cameras". There are many cameras in this lineup, including the Honeywell IPCAM-PT2, the Honeywell IPCAM-PT, the Honeywell IPCAM-WI2, the Honeywell IPCAM-WL, and the Honeywell IPCAM-WO. These cameras record in standard-definition, and the video quality is not as good as the newer HD cameras. But one advantage to these cameras is that they can be streamed directly from the Lyric. It's somewhat surprising that Honeywell removed this feature from their newer HD cameras. But if you want to stream from the Lyric, you will need a legacy camera. Only the Honeywell IPCAM-PT2 is still sold by Alarm Grid. But if you can find the cameras elsewhere, they can still be activated and used. In order to stream from Total Connect 2.0, you will need an alarm monitoring plan that includes video surveillance. For Alarm Grid customers, a Platinum-level Plan is required. However, streaming from a Lyric Panel with a legacy IP camera is done locally, and technically no monitoring plan is required. 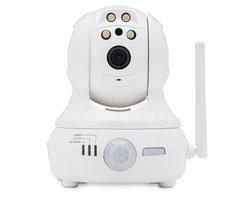 But since a user will generally want to view their cameras remotely, Total Connect 2.0 is usually the main way to view Honeywell IP Cameras. A user can access Total Connect 2.0 from a web browser or from the Total Connect 2.0 Mobile App to view their cameras. 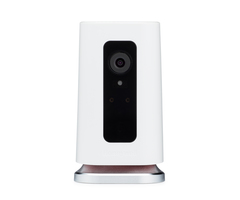 There are also the SkyBell Doorbell Cameras, specifically the SkyBell DBCAM and the SkyBell DBCAM-TRIM. As doorbell cameras, these devices can be used without a monitoring plan that includes video surveillance. A user just needs a monitoring plan that includes access to Total Connect 2.0 so that they can stream the cameras from the service. They can also receive text and/or email alerts from Total Connect 2.0 whenever someone is at their door. If you decide to get SkyBell Doorbell Cameras for use with Total Connect 2.0, make sure that you do not choose the Alarm.com versions by mistake.